he final games of the Irish Lacrosse League and Irish Women’s Lacrosse League took place this past weekend in St. Anne’s Park. Both leagues came down to the wire in some exciting action over the weekend. In the first match of the day the Avengers knew that a win would be enough to see them as the winners of the ILL and they set about their mission to capture their first ever title with an impressive 19-1 win over their west coast opponents. The win and the scoreline meant there was a mountain to climb if UCD was to try to over take the Avengers and all but, clinched the title for the Avengers. It Avengers Captain Sean Gibson led all scorers with 5 goals and 1 assist and in the process captured the ILL Top Scoring title for the third time. Avengers rookie Drew Wichmann set a league record for most assists in a single game with 7 which, also saw him beat the single season assist record with 13 which, was originally set back in 2009 by Paddy O’Leary who earned 11 that year. Tony Devine (1,4), Michael Kennedy (4,1), and Richard Blanc (3,0) all had impressive games and Avengers Goalie Danny Jones earned the win and capped off an impressive first season with the Avengers. NUIG’s Ryan Doran was the lone scorer for the Galway outfit. UCD entered the game knowing that they needed a win and to score at least 46 goals on the Prawns in order to have a chance. While the Prawns knew they could spoil any chance that UCD had if they were to beat UCD. It would be the Prawns who would take an early 4-2 lead into the half time break as Kevin Quinn was solid in the Prawns goal while offense was being led by team captain Martin Scanlon and Irish International Paul Murran. Speaking of Kevin Quinn, just before the half time break Kevin became the first goalie in ILL history to register a goal as he went coast to coast. The second half saw UCD turn it around. 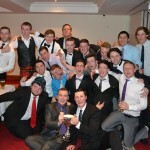 It would be ‘Jeff 23′ and the arrival of UCD Captain Sean O’Shawnessy that would compose the students and with a more organized structure UCD was able to work themselves back in to the game. UCD would finish the eventual winners in a great game for both teams with a scoreline of 9-7 to cap off a great season of lacrosse. 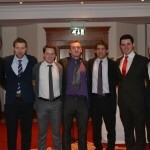 So with both leagues settled it was onto the Ireland Lacrosse Awards night hosted by UCD at the Gresham Hotel. This year saw individual awards for the National Indoor Lacrosse League, Irish Lacrosse League, and the Irish Women’s Lacrosse League. Along with all team awards. 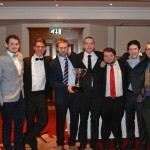 The Evening started off with Ireland Lacrosse CEO presenting the 2014 Newtownard’s Cup to UCD who defeated the Avengers in a thriller back in November. 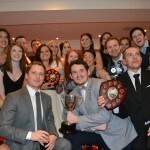 It was then onto the Indoor Awards. 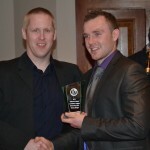 This year’s Top Scorer went to Sean Gibson (Thunder) who had an impressive tally of 24 goals. 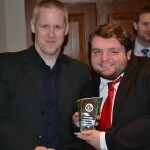 The Rookie of the Year was awarded to Cian Rushe (Thunder) who was a standout in his first season of indoor. 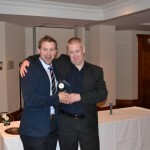 The 2014 Defensive MVP was awarded to the Thunders’ Tadgh Bolger while Stormtroopers Michael Kennedy took the Offensive MVP honors for the second straight year. 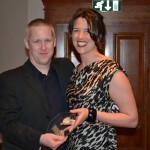 It would be the Darkside’s Kevin Quinn who was awarded the “2014 Happy Glimore Award”. The Thunder were crowned the NILL Champions only losing one game during the season. 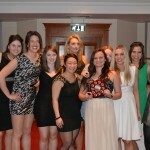 It was then on to the Irish Women Lacrosse League Awards presented by IL Women’s Director Katelyn Billups. 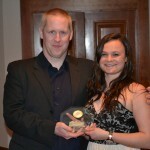 This year the Rookie of the Year was awarded to Sonja Egan(UCD) who was impressive in her first season. 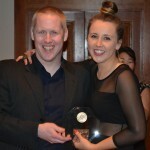 Most Improved honors went to the Avengers Michelle Ni Sullivan. 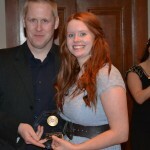 The 2014 IWLL Defensive MVP was awarded to Rebecca Headon Avengers while the 2014 Offensive MVP was presented to Aisling Casey (Avengers). For the first time the IWLL awarded a national championship and the Dublin Avengers took the crown. 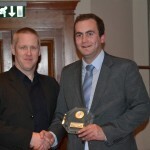 It was onto the 5th annual Irish Lacrosse League awards. 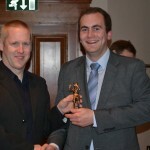 This year the ILL Top Scorer was Sean Gibson (Avengers) with 22 goals. 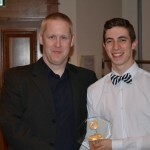 The 2014 Rookie of the Year was awarded to Matt Doncel (UCD). 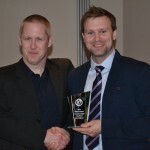 In very close voting the 2014 Defensive MVP was awarded to Prawns Goalie Kevin Quinn. 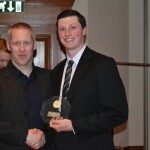 The 2014 Offensive MVP was awarded to Sean O’Shawnessy (UCD) who was a standout at the university this year. 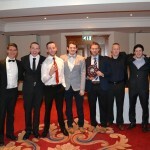 This year’s league champions were the Dublin Avengers who, claimed the title for the first time. 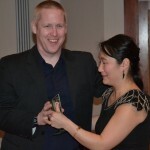 Congrats to all of this year’s award winners!